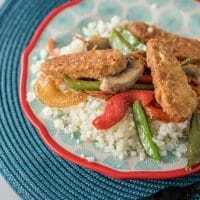 This vegan stir-fry is packed with flavor from a medley of delicious veggies and a simple, homemade stir-fry sauce. And the best part? It cooks up in just 20 minutes! Serve it over riced cauliflower for an easy plant-based meal you can feel great about. 2 tbsp Earth Balance® Organic Whipped Buttery Spread. Preheat oven to 375 degrees Fahrenheit. Spread Crispy Tenders in a single layer on a baking sheet, and bake for 12-15 minutes until heated through. When cooked, remove from oven and set aside. Prepare the stir-fry sauce. In a small bowl, whisk together the soy sauce, rice vinegar, sesame oil, brown sugar, and red chili flakes. Set aside. Heat the Earth Balance spread in a large wok over medium-high heat. Add all of the veggies and stir-fry for 5-6 minutes until softened. Add the Crispy Tenders and stir-fry sauce. Stir and cook for additional 2-3 minutes. Prepare the riced cauliflower in the microwave, according to the package directions. Serve the stir-fry over top of the riced cauliflower.